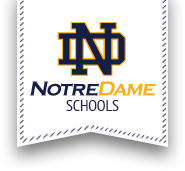 Undoubtedly many fans of the area are convinced that the Notre Dame nickname, the Jugglers, derives from our team's ability in handling the ball on the football fields and/or the basketball courts. This however, is not so. If you do the best you can, God will be pleased. In choosing this as our nickname, we hope that all of Our Lady's Jugglers here at Notre Dame will have the same inspiration to do their best.